Ready for summer? According to the weather report in two weeks summer is here already. So what are your plans? Are you ready to visit your top destinations here and abroad? I guess this shared post in Facebook could help. MARCH Awaited! 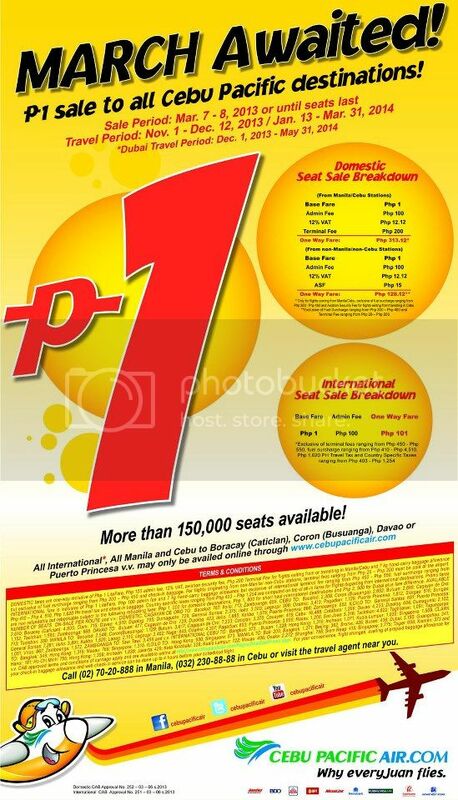 P1 sale to All Cebu Pacific destinations! Our latest Seat Sale is now up. 🙂 Who wouldn’t love piso fare? Sale period up to March 8, 2013 or until seats last. Travel period November 1 – December 12, 2012 / January 13 – March 31, 2014. This includes Philippine destinations and international destinations. For more information you can visit Cebu Pacific Air official site.